At a time of great change in the world, it’s increasingly important that research is rigorous and relevant but also communicated widely, UTS Deputy Vice-Chancellor, Research, Professor Glenn Wightwick, said at the launch of UTS Business School’s annual research report today. “Our research is the solid base on which we operate but, in the world in which we find ourselves, we need to find ways to make our work more accessible, so people can make more informed decisions,” Professor Wightwick said. Research was about more than publication in academic journals and university rankings, UTS Business School Dean Professor Roy Green added. “We don’t do research for its own sake. The research projects, the portfolios of research that we are all developing, also have a social and economic purpose. UTS Business School’s Associate Dean, Research, Professor Ashish Sinha, said he joined UTS a year ago because he wanted to be part of a business school that “walks the talk of knowledge with impact”. UTS Business School was third equal in Australia across Economics and Commerce & Management in the latest round of the Excellence in Research Australia (ERA) assessment. 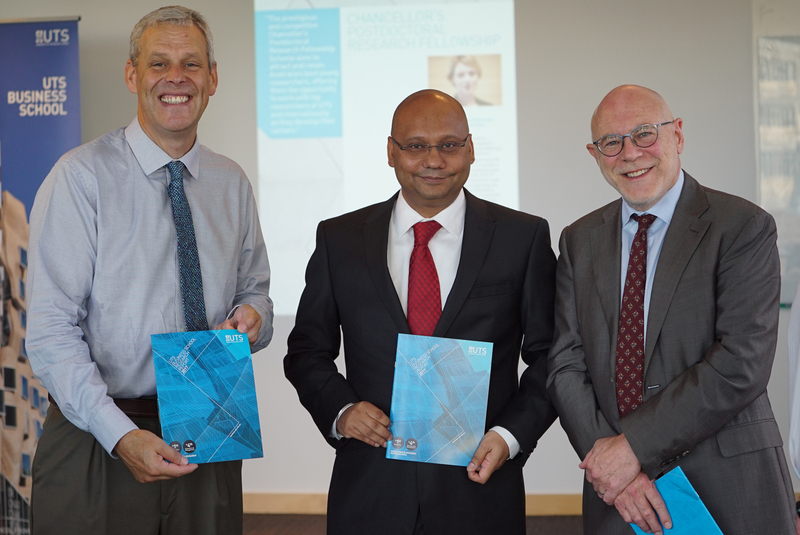 The research report looks at key areas for the Business School, which is home to the world-leading Centre for Health Economics Research and Evaluation (CHERE), the Centre for Policy and Market Design (CPMD) and the new Centre for Business and Social Innovation (CBSI). Other important research themes include business intelligence and data analytics; financial markets and information; and quantitative finance. Projects covered in the report include research looking at disability entrepreneurship in Australia; social stock exchanges; corporate board behaviour; the impact of social interactions on investors, asset prices and portfolio management; and the impact of the Medicare safety net on moral hazard, equity and welfare. Read the 2017 UTS Business School Research Report. © Copyright UTS - CRICOS Provider No: 00099F - 05 September 2017 06:52 PM. The page is authorised by Deputy Vice-Chancellor and Vice-President (Corporate Services).